INTRO: I wanted a new player with great sound I could comfortably wear on my arm at the gym. Cowon players have a strong reputation for better sound than most players. The Cowon iAudio 9 (aka "i9") is similar in size to the previous generation iPod Nano and promised impressive audio performance. So I bought one and figured some objective testing was in order given all the praise for these players. WHO’s COWON? 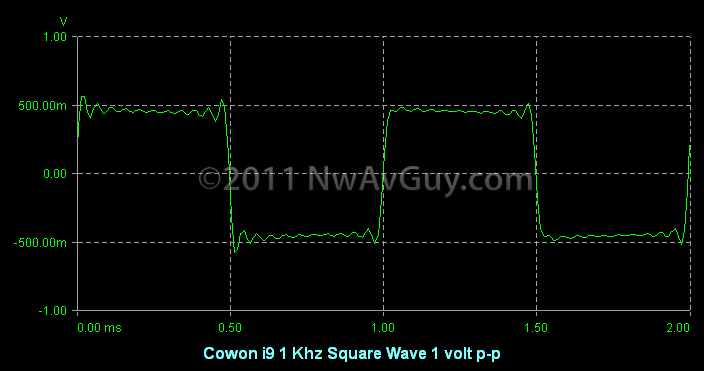 Unlike say Apple, Creative, Sony, or even Sandisk/Sansa, a lot of people have never heard of Cowon. They’ve been making players for many years and seem to have a fairly small but loyal following in the USA. Their headquarters are in Korea and they’re represented by JetAudio in the USA. I couldn’t find an address or even phone number for JetAudio. I could only find a contact form on their website which isn’t very encouraging if you need support. THE iAudio 9: The $120 - $180 Cowon i9 has been around since 2009 and is still a current Cowon model. It can be seen in the photo to the right of my iPod Touch 3G with the protective plastic still stuck to it and some test files displayed. It's impressively thin (far slimmer than the Sansa e200 series), and the display is bright and clear. There’s an unusual touch pad on the top and 4 controls on the sides, including volume up/down, but unfortunately they’re located right where you're most tempted to wrap your palm around the i9 when holding it making the buttons more awkward to use. FORM OVER FUNCTION: The user interface follows a popular theme in many Asian-designed products where "cute", "flashy" or “different” are often favored over ease-of-use. Of course Apple products are designed in California and they're often guilty of putting form-over-function as well. But Apple does such a good job with certain things, many don't seem to mind when they hold their iPhone 4 wrong it drops their calls. But, regardless, design compromises in the interest of fashion, or just to be different, can be frustrating and that includes the i9 user interface. The Sansa Clip+, for example, makes do with a standard 4-way “D” pad and 2 other buttons quite nicely. The iPods are even more elegant. Just about any player I’ve encountered is easier for a stranger to just pick up and use compared to the i9. FLAC SUPPORT: Another reason for buying the i9 was FLAC support. Perhaps 75% of my library is now in FLAC. So it's a big plus to have it natively supported on a portable player. To my knowledge, none of the current iPods support FLAC although the Clip+ (and any Rockbox player) does. NO iTUNES REQUIRED: Lots of people dislike iTunes--especially on Windows. It's rather invasive and some even consider it "malware" as it can do things like re-tag your music collection with Apple proprietary tags and is often doing things you don't want in the background or trying to sell you something via the iTunes Store. The whole sync process can also be rather slow and more involved than it need be for just throwing a few new songs on your player. Plenty of angry prose has already been written about iTunes so I'll leave it at that. But it's nice the Cowon players don't need it and work with simple "drag and drop" if you want. PROPRIETARY USB JACK: Apple iPods require a special Apple licensed "dock" connector to charge them because Apple gets a ransom (err… royalty) from everyone who makes anything that mates to an iPod/iPhone using their connector—even a lowly USB cable. And if you already have other devices that use the standard USB mini/micro jacks (like say your non-Apple phone), it's a hassle to have to use another charger/adapter/cable to also charge your Apple device. But at least iPod's are so popular virtually everyone offers various cables and adapters that fit them. But Cowon chose to use a tiny proprietary weird USB jack that's roughly the same size as the widely used micro USB jack. If you lose the cable that comes with it, your player will soon be dead until you special order another custom cable from one of the very few sources even selling them. To me, that's more than a little obnoxious. I’m betting there will be lots of dead Cowon’s out in the wild from people who forgot their cable at home, can’t find it, etc. LACK OF ACCESSORIES: One downside of Cowon players is because of their smaller market share there are relatively few accessories available—especially for the i9. So if you want a really nice neoprene sports armband that accommodates all the controls, for example, you’re probably out of luck. OTHER DETAILS: The i9 has several features you won't find on an iPod. With this review, I mainly wanted to evaluate its audio performance. You can find other reviews on the web that go into the features not covered here. A FEW WORDS ABOUT EQ: It's generally accepted the only fair way to compare two different players is with the EQ off. EQ can be nearly infinitely adjustable, the same settings/options are not usually available on different players, and everyone's taste in EQ is different--all of which make comparisons all but impossible. So the only fair way to compare sound quality is with the EQ turned off so it’s more apples-to-apples instead of bass-boosted to vocal-emphasis. The player that's most accurate with the EQ off should respond even better to cranking in whatever EQ a particular user might enjoy. The idea is to find out how solid the basic foundation is before you start modifying things. 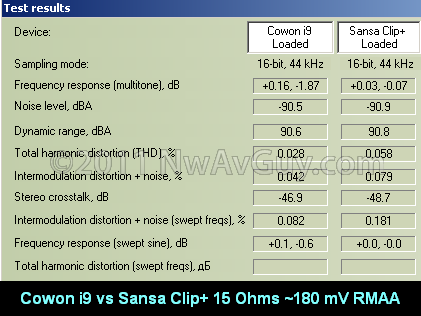 COWON'S EQ: The i9 has a wealth of EQ options including several licensed from BBE. The BBE technology involves specific EQ curves and sometimes crossfeed or other "soundstage" enhancements. More advanced BBE choices may include dynamic processing. Some of the choices do sound good on certain kinds of music. Some, to my ears, are rather overdone or irritating. But, on the whole, there are more useful EQ selections on the Cowon than the iPod (but see Third Party EQ below). ADJUSTABLE EQ (edit 2/24/11): I also chose the i9 as, I was under the impression, it had parametric EQ. 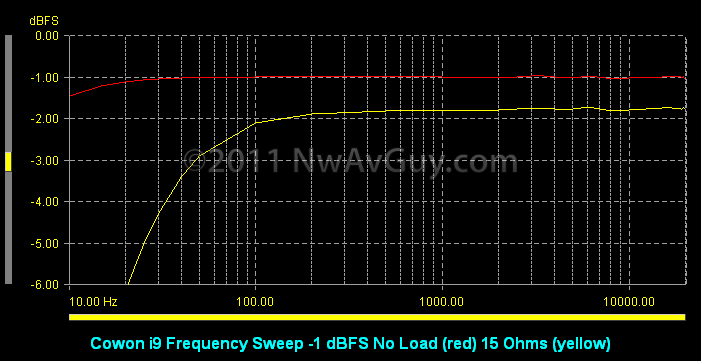 Normal adjustable EQ has fixed frequency "bands" that you can boost or cut. The i9 was advertised as having bands that were adjustable in frequency like a parametric equalizer. In reality this feature is disappointing. 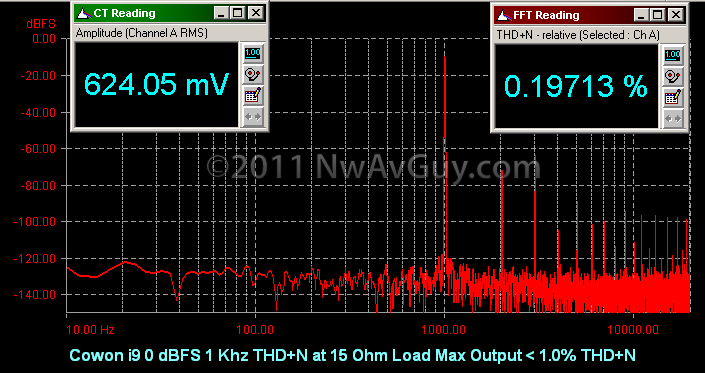 Each band has only a few fixed frequency and width choices and the lowest frequency possible isn't all that low. For example, you're stuck with boomy (rather than deep) if you want to dial in some bass boost. THIRD PARTY EQ CLOSES THE GAP: It's worth mentioning there are some very nice third party EQ options on some players. The popular Rockbox firmware supports dozens of different players (including the inexpensive Clip+ but not the i9) and has, among other things, true parametric EQ that's extremely flexible and can be used in conjunction with the equally flexible crossfeed options to, with some experimentation, recreate most any of the fixed settings on the i9. There's also EQu for the iPod Touch 3G and 4G (and iPhone 4). It's a $3 app with very flexible EQ options and goes a long way towards closing the gap between the iPod’s EQ and the i9’s. WHAT ABOUT THE SOUND (subjective impressions)? Given the less-than-friendly user interface, weird USB jack, etc. there must be some other reason people pay $120+ for these, right? I’ve read it's the sound quality. Before measuring the i9 I spent some time listening to some of my favorite music with a variety of headphones and I was reasonably pleased with the sound. With most of the headphones I tried, it played loud enough for my tastes and didn’t have any obvious sonic flaws. COMPARISONS: Without any EQ (the only fair way to directly compare the two), the i9 didn't sound obviously better than my iPod Touch. Getting the iPod's clean sound in a smaller/cheaper package isn't a bad thing but what about the Sansa Clip+? It’s even smaller and cheaper than the i9. Using very high-end headphones, and some of my favorite highly revealing acoustic tracks of music, I wasn’t sure I could hear any obvious differences with the Clip either. That's not to say there are none, but they don't stand out in a casual comparison at normal listening levels. AUDIBLE HISS: Playing back a really low signal with my most efficient headphones (UE SuperFi's) the Cowon i9 had some audible hiss but it wasn't objectionable. It's about the same as the Clip+. It was, however, more obvious than the Touch 3G's noise level. With more typical headphones the hiss will likely be inaudible. 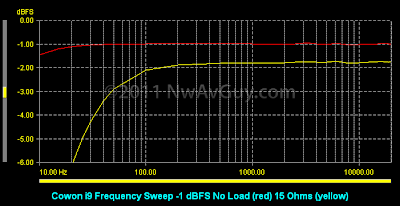 Frequency Response: With a typical load, the i9 starts rolling off in the bass at 100 hz until it's about 4.2 dB down at 20 hz. That's a significant roll off and is much worse than the iPod or Clip+ both of which stay ruler flat all the way down to 10 hz. With good headphones and the right music, this is likely audible and would make the Cowon sound a bit weaker in the deep bass. 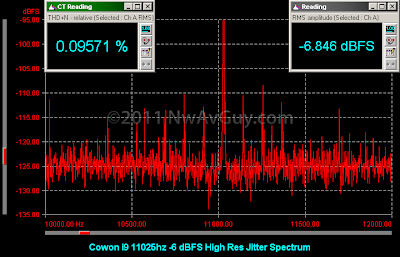 Above 100 hz the response is fine. Distortion: At typical listening levels, THD+N distortion was roughly 0.02% from 20hz to 1 Khz, but rose to about 0.4% at 10 Khz. This is decent but not great performance. It’s fairly similar to the Sansa Clip+ overall with the i9 doing better at 1 Khz and the Clip doing better at 10 Khz. Maximum Output: The i9 has higher than average power output--about 2 dB higher than what the iPod can manage into the same load. 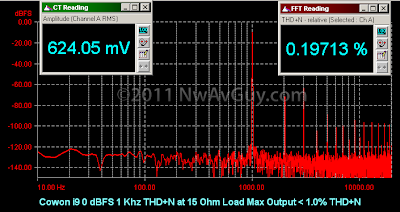 It delivers roughly 24 mW into 16 ohms. This gives the i9 a bit more "headroom" for inefficient headphones or those who like their music really loud. 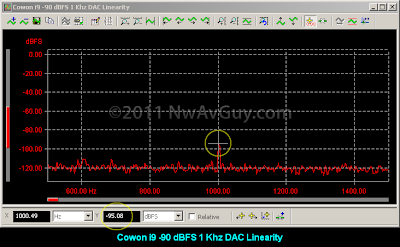 Output Impedance: The Cowon is better than average here. The output impedance was about 1.5 ohms which should keep frequency variations with even some of the more wild headphones to within +/- 1.5 dB or so. DAC Performance: The square response was clean but the DAC linearity was a bit off at low levels and the i9 might have higher than average jitter. So the DAC results are kind of mixed. i9 vs CLIP+: If a person doesn’t need the higher output of the i9 I think the Clip+ is a better player overall. The Clip+ has much better bass response, less high frequency distortion, and otherwise very similar performance for about 1/3 or 1/4 the price. The Clip also runs the excellent Rockbox firmware, is smaller, and doesn’t require buying an armband to wear on your arm (shirtsleeve). 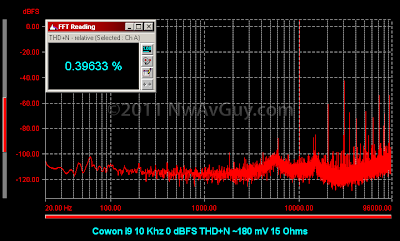 If that extra few dB of output power is important to you, or you’re just in love with Cowon’s particular choices of EQ or some other unique i9 feature, than I’d say go for the i9. 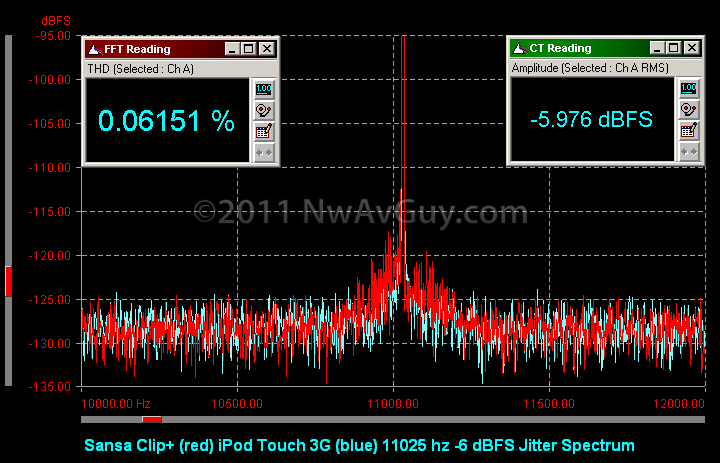 i9 vs iPOD TOUCH 3G: The iPod has much lower distortion across the spectrum and also lower noise and arguably better DAC performance. And with the $3 EQu app, it offers impressive EQ. The Touch of course also runs iOS apps, plays games, has bluetooth, WiFi, a much bigger screen, etc. But, the flipside is it’s bigger, heavier, more expensive, generally requires iTunes, won’t play FLAC files, is missing several of the i9’s features, and has a higher output impedance which makes it a bit more fussy about what headphones you pair it with. With typical dynamic headphones, if audio quality was the main focus, I’d likely pick the iPod over the i9. 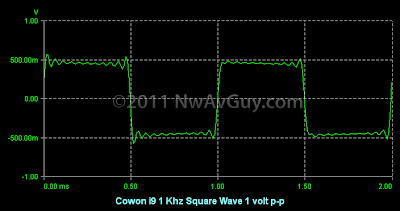 For higher-end balanced armature headphones, however, the Cowon or Clip+ would be my pick. 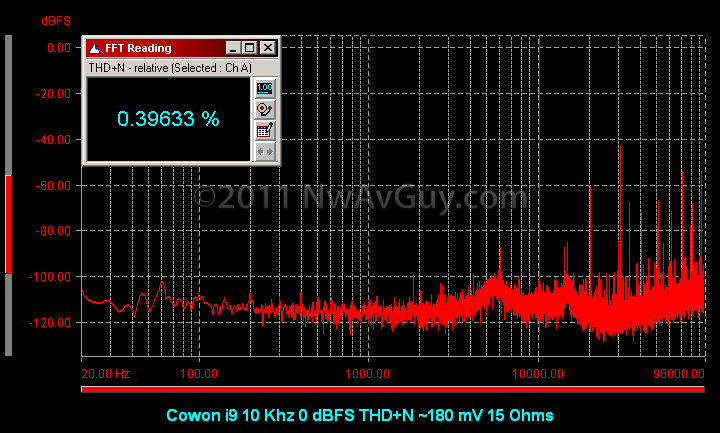 BOTTOM LINE: The Cowon i9 delivers fairly respectable audio performance but it's by no means at the top of it's class. Even the smaller and cheaper Sansa Clip+ outdoes it in some significant ways. And I'm not crazy about the user interface or proprietary USB jack. To me, it doesn’t do enough better than the Clip+ to justify its higher price, higher hassles, and potential performance problems. 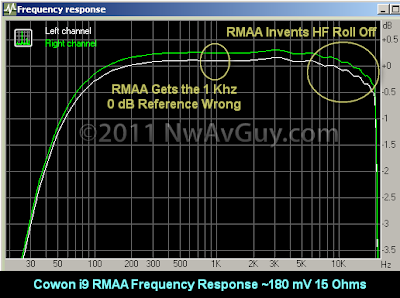 While RMAA confirms about the same low frequency roll off, note how RMAA shows a high frequency roll off when the dScope result above it does not. It starts around 10 Khz and falls off a cliff right before 20 Khz. This is likely a result of RMAA's multi-tone analysis being flawed. 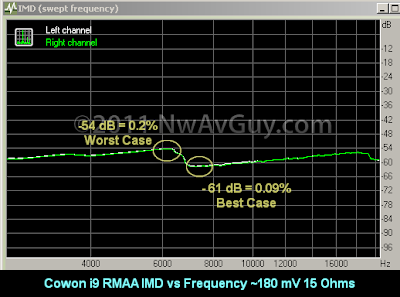 But I have verified the i9 does not roll off the way RMAA claims it does in the high frequencies. RMAA is also supposed to set its own relative 0 dB level which is generally done at 1 Khz. But it fails to do so accurately sometimes (like above). All this stuff is "automatic" in RMAA and, unlike with a real audio analyzer, the RMAA user has little control over any of it. It either delivers good results or it doesn't. And without anything to compare RMAA results to, you never know if the results are correct or not! Note RMAA shows 3 times the THD at 1 Khz and slightly less THD at 10 Khz compared to the dScope but it does generally confirm similar results. 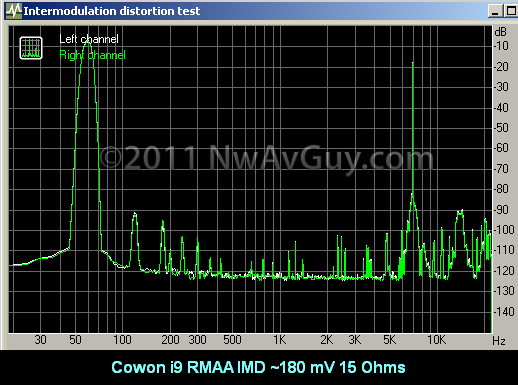 I’m not sure what’s going on above 10 Khz but it’s likely an RMAA problem, not the i9. DISTORTION SUMMARY: Overall, the i9 distortion results are only average. The i9 is similar to the much cheaper Sansa Clip+. And it's vastly worse across the board compared to the iPod Touch 3G. See my comments in the distortion section of the Sansa Clip+ review for more background on distortion measurements. It’s likely the i9 doesn’t have any seriously audible distortion problems. DAC LINEARITY: See the Sansa Clip+ review for some background on why this matters, but it's one common measure of the quality and implementation of the DAC in a portable player. The i9 didn't do as well as the Clip+ or iPod here. 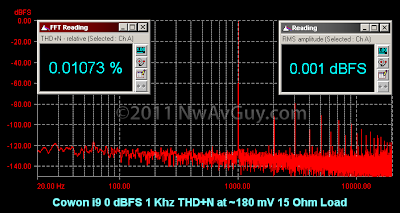 The -90 dBFS test signal measured -95 dBFS on the i9. This may cause some dynamic audible distortions when listening at low levels but they're not likely to be very objectionable. NOISE: The noise performance of the i9 is very similar to the Clip+ both on the dScope and RMAA. 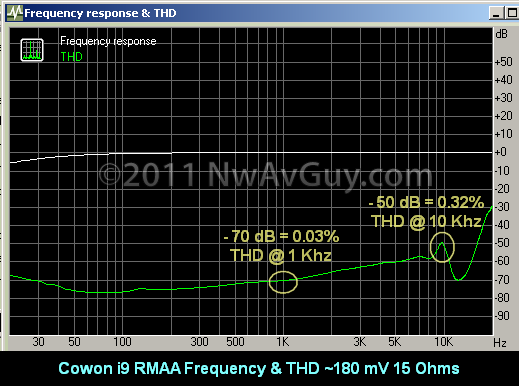 You can see in the graph above the noise floor is right at the same -120 dB as in the Clip+ review. The iPod does a few dB better than both of them. 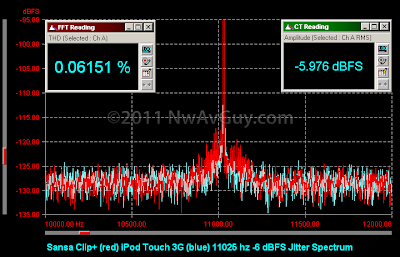 CHANNEL BALANCE & SEPARATION: The channel balance was within 0.3 dB which is generally considered "good enough" but ever so slightly worse than the Clip+ and iPod. The channel separation (stereo crosstalk) was about 2dB better than the Clip+ at about 52 dB but it was 8 dB worse than the iPod's 60 dB. 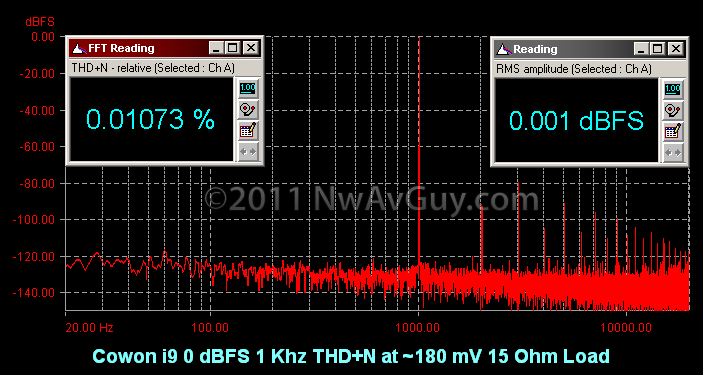 Both tests are with a 15 ohm load at ~180 mV for all players. TEST SUMMARY: The i9 delivers mostly respectable performance and even excels in a few areas like maximum output and the square wave performance. 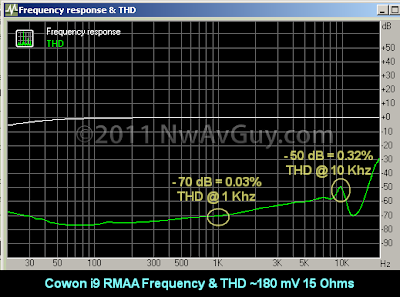 But it has weak low frequency response into a typical load and the DAC linearity isn't great. Overall is it worth several times the price of the Clip+? I personally don't think it is. But, for some, it might still be a good choice. TEST DETAILS: The i9 was running the latest V1.14 firmware from May 2010. Jeez that was disappointing, I expected much better from Cowon, especially at this price (at least compared to the Clip+). I would love to see how a player like the Archos 32 would do. This player would be a good alternative to the iPod Touch 8gb for over $100 cheaper. Ppppplease! Anonymous, Do you have an Archos 32? About one in 4 reviews on Amazon says it locks up all the time, Archos customer support is horrible, they die completely and have to be returned, the WiFi range is very poor, etc. I have an Android phone (which, sadly, has its headphone output restricted to meet European regulations) and I've been waiting for a solid inexpensive Android PMP. It sounds like Archos might have cut too many corners? Interesting design choices. 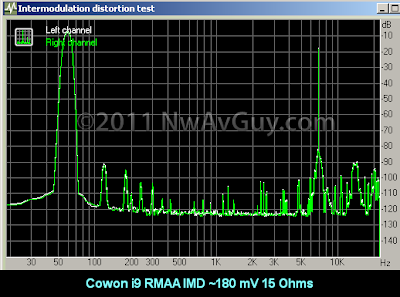 The Cowon U5 has a higher output impedance that is very intolerant of low impedance headphones (rolled off the bass with them) but as a line out is much flatter. It also measures even better than the Sansa Clip V2 (non plus model) and has an obviously more refined sound than anything I've heard from Sansa. I do like your all review in terms of audio technology. I need your Recommendation for buying the Cowon X7, FiiO E7 and Sennheiser HD598. I now have an iPod 4th 32Gb and Klisph S4i. I want to upgrade my audiophile experience so i don't mind to spend more money for these. 1) Do the set of Cowon X7 player, FiiO E7 portable DAC/amp and headphone Sennheiser HD598 match together for lossless experience? 3) Do i need to buy the Sennheiser 598 for the Cowon X7 enhancement, or i can use my old Klisph? 4) Can the headphone Sennheiser work well with Cowon X7 or iPod without portable amp E7? Note: I also want to use E7 and Sennheiser for my lossless music on laptop. Thanks in advance for your comment. The iTouch 4G will likely outperform, or match, any Cowon player except for maximum output. I would just keep your iPod. The user interface on any Cowon is nowhere near as nice, and you can't run tens of thousands of cool apps on a Cowon, check your email, etc. I would try the HD598 without an amp on your iPod. If it's loud enough, smile and be happy. :) If it's not, buy a FiiO E6 and be happy. You don't need a USB DAC, like the E7, for iPod use. The DAC in the Touch 4G is better than most outboard DACs. Using an external DAC with the Touch 4G is just snake oil and a bad idea. But the E7 cannot even be used that way. You need something like the HRT iStreamer but it's still a waste of money. Thanks NwAvGuy for your quick reply. I know iPod has a good DAC, but it can't play FLAC, APE. So i need your advice again for the sound quality between COWON Lossless support with BBE and iPod with lot of good stuff, better DAC and doesn't support Lossess (except ALAC - lossless conversion). If it was ALAC, is there any different with FLAC in terms of sound quality? I'm also asked you about iPod with Fiio E7 vs NuForce uDAC-2 in this "http://nwavguy.blogspot.com/2011/02/nuforce-udac-2-drama.html and http://nwavguy.blogspot.com/2011/05/fiio-e7-usb-dac-amp.html". After read your advices, then i refer buying E7 for my iPod. So now i don't need to buy E7 anymore, do I? In summary, i have some final questions for your advice. 1) If your answer for the above question about Lossless music is COWON Player, so what is the best Portable DAC/Amp for it? EX: E6/E11 with amplifier function only or E7/E10 with DAC/Amp? 2)If not COWON, i will keep my iPod and try it with new Sennheiser HD598 and/or E5/E6/E10 with Amp function. 3) I also want to listen my Lossless file on laptop more often when at work and at home (Portable player for other time on bus, exercise...) with new Sennheiser HD598. So, which is your recommendation for the DAC/amp device? EX: uDAC-2, E7 or E7/E9 combo, E10? Hope you understand my confusing. I really appreciate your help, and you are the expert so far i know about this field. I tried to search many web page, but most of them not enough info like which one i read here.